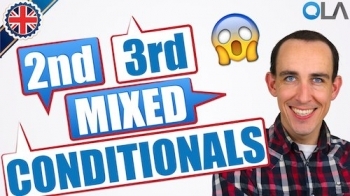 In this lesson with Greg from Online Language Academy you will learn all about the Second, Third and Mixed Conditionals in advanced English grammar. 樂When do we use it? We use the second conditional to talk about unreal, impossible or imaginary situations. 樂How do we form it? If I won the lottery, I would visit my friend in Australia. If I were a giraffe, I would have a very long neck. If I spoke English more frequently, I would be more fluent. I'd feel better if I didn't have a cold. I'd go to the beach if it wasn't raining. If I were you, I'd take the job! We use the third conditional to talk about something that did not happen in the past. If I had been tall as a child, I would have played basketball. I would have gone to the beach yesterday if it hadn't rained. If I had seen her, I would have said hello. What would you have done if it had rained at the weekend? I would have been angry if we had lost the game. She would have come to class if she hadn't been busy. We use the mixed conditional to talk about the probable result in the present of something that did not happen in the past. If I had been tall as a child, I would be better at basketball now. If I had studied harder, I would have a degree now. If I had gone to the beach yesterday, I would be tanned. If I had seen her, I would be happy. If we had lost the game, we wouldn't be top of the league. If he had got the job, he would be living in America now.